We’ve Got Your Secrets Aura Wedding Questions Answered! Planning a destination wedding in Cozumel? We’re sure you have plenty of questions as you’re getting started. Here’s a handy list of FAQs to help make your wedding planning at Secrets Aura Cozumel a breeze! A beautiful destination wedding ceremony on the beach at Secrets Aura Cozumel. What an honor! To celebrate #TravelTuesday, we’re toasting to Secrets Aura Cozumel‘s Booking.com Award of Excellence! 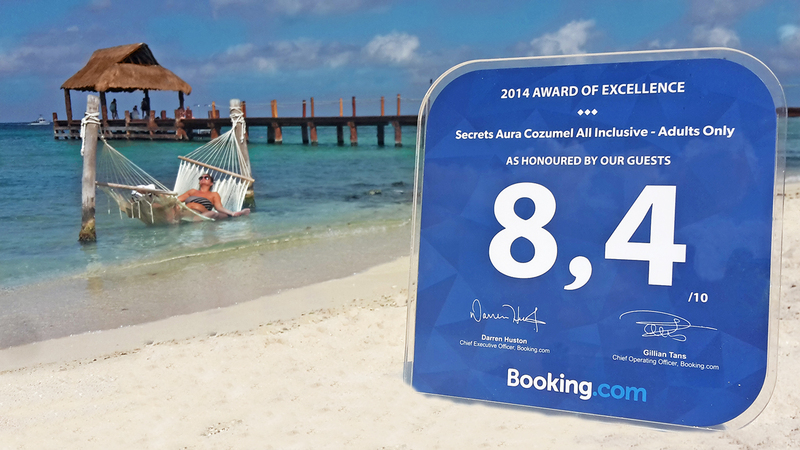 Secrets Aura Cozumel is the proud recipient of a Booking.com 2014 Award of Excellence! The only adults-only resort of its kind on picturesque Cozumel, Secrets Aura Cozumel combines all of the amenities of Unlimited-Luxury® with an unparalleled island vacation experience. We are delighted and honored to accept a 2014 Award of Excellence for the Booking.com Guest Review Awards in recognition of Secrets Aura Cozumel‘s dedication and care in meeting and exceeding guests’ expectations. By achieving an overall guest review score of 8 or above, based on a minimum of 10 reviews as of December 31, 2014, Secrets Aura Cozumel was honored with this award as a clear demonstration of our outstanding commitment to our guests and delivering consistently amazing stays. 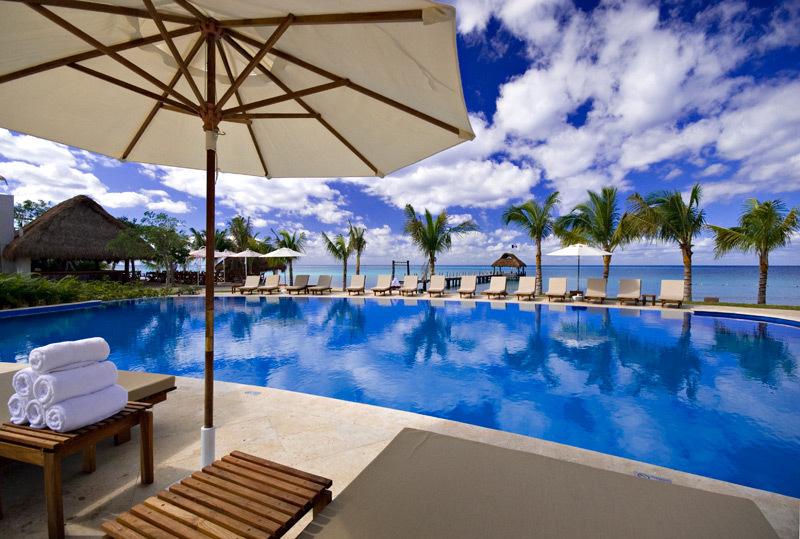 Guests can enjoy lounging by the pool just steps away from the picturesque beach at Secrets Aura Cozumel. At Secrets Aura Cozumel, Unlimited-Luxury® is more than just a phrase. It’s a commitment to fulfilling your every wish and exceeding your expectations at every turn. It includes every amenity you’d expect from a world-class destination and so much more which is why we’re so thrilled to have been recognized for our service with a Booking.com award! From elegant accommodations with stunning views to a private concierge on 24/7 call, gourmet dining at five on-site restaurants and day and nighttime activities and entertainment- the luxurious amenities are never ending. 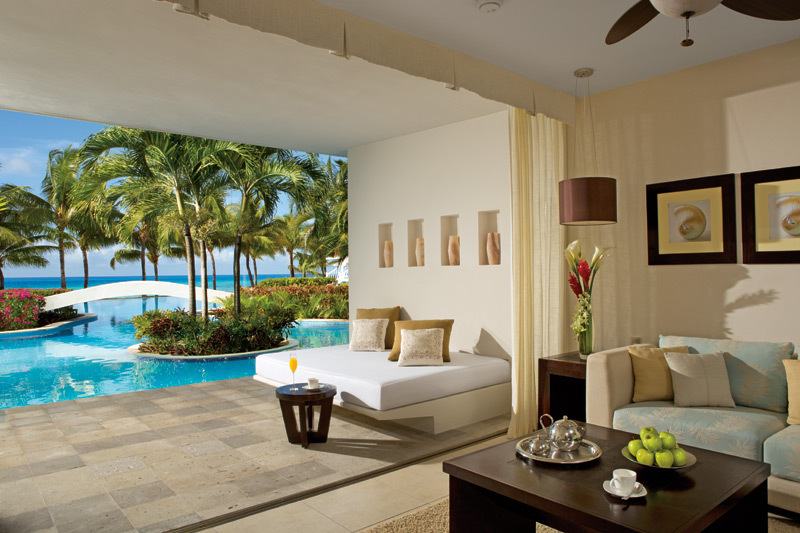 Swim-Up suites offer direct swim-up access from the swimming pools at Secrets Aura Cozumel. If our new award wasn’t incentive enough to plan a visit to Secrets Aura Cozumel, our special offer will make planning a trip irresistible – the longer you stay, the more you save! 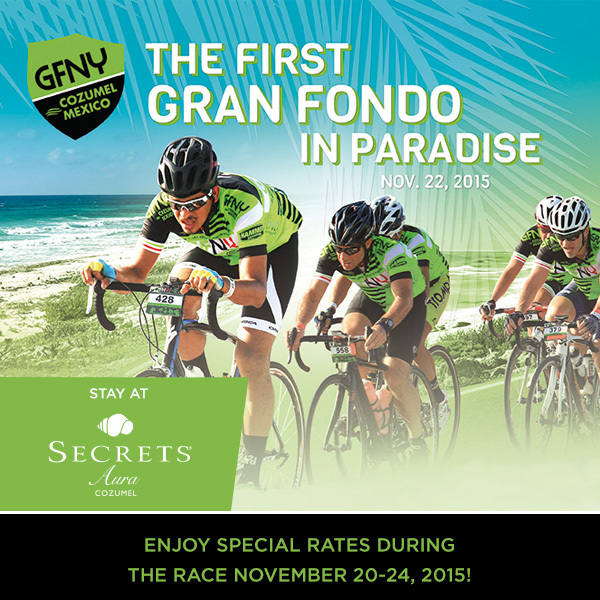 Guests can get a $50 air credit per room, per night when you reserve your stay at any Secrets Resort & Spa by April 24, 2015 for travel from February 25, 2015 to August 21, 2015. Plus, receive up to $400 in resort coupons with the Unlimited Air Credit promotion! Book your Secrets Aura Cozumel vacation today and see what all of the hype is about – we’ll wait to toast to our new award with you! Join the Carnival spirit at Secrets Aura Cozumel! This February, Cozumel will be shining with glitter, party dresses and decorations as Cozumel Carnival comes to town! The island will turn into a colorful party from February 11th to the 17th to celebrate Cozumel Carnival 2015 and Secrets Aura Cozumel is ready! 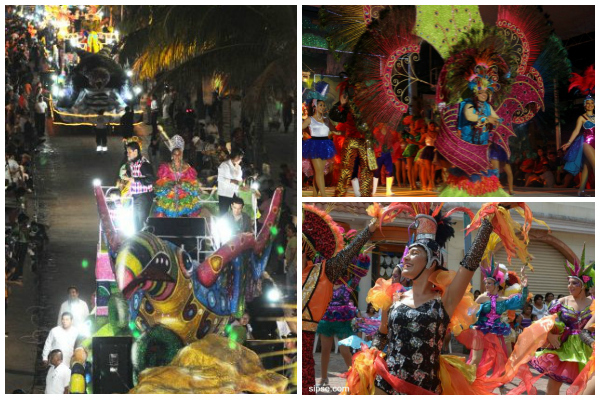 The streets of Cozumel come alive during Carnival! Cozumel Carnival has been celebrated since 1908. The festivities include nights of lively, colorful parades gathering not only the people of Cozumel but visitors from all over to enjoy the party of the year. It’s not just a big party, Cozumel Carnival is extremely relevant to the commitment of Cozumel’s habitants to preserve their traditions. Each year participants show up with better costumes, better make-up and more intricate dance moves! 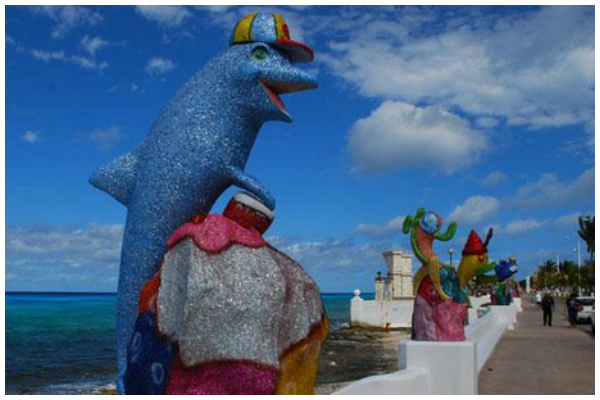 Colorful statues brighten Cozumel’s main street. Downtown, where the festivities will take place, is located just 15 minutes away from Secrets Aura Cozumel, the Only adults resort in Cozumel. It is recommended to arrive to Rafael E. Melgar, Cozumel’s main street, around 5:00 p.m. each day to secure a good spot to see the parades. Our sister resort Sunscape Sabor Cozumel will hold a costume contest on February 14th! You are welcome to join and participate for the chance to win amazing prizes! Bring your costume and join the celebration! Secrets Aura Cozumel is always a colorful, fun place to visit. Check out our special offers and see for yourself!